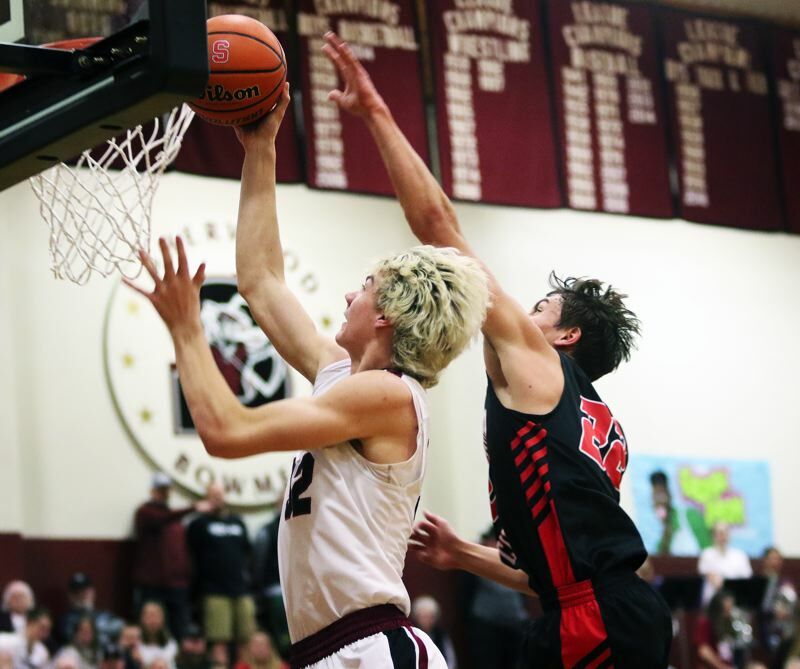 SHERWOOD — With the start of Three Rivers League play right around the corner, the Oregon City High School boys basketball team was hoping for a strong performance in a competitive game. With Pacific Conference play soon to start, the Sherwood squad was looking to fine tune with an intense battle. Well, both teams got what they wanted, with the Pioneers getting something else — a hard-fought, well-earned victory. 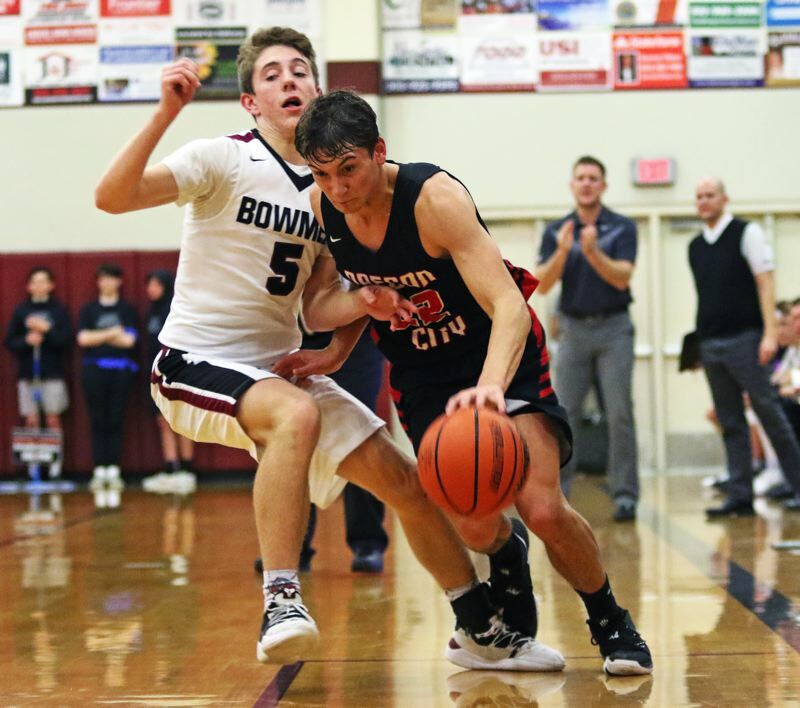 Oregon City, pulling away late in a back-and-forth battle, got a 62-54 win over the Bowmen in a non-league game played in front of a large, loud crowd Friday at Sherwood High School. "This is a big win," said Oregon City senior guard Corban Remsburg, who led all scorers in the contest with 18 points. "It's our last game before league, so it will give us a lot of momentum going in. And it was a good crowd, and they're a good team." 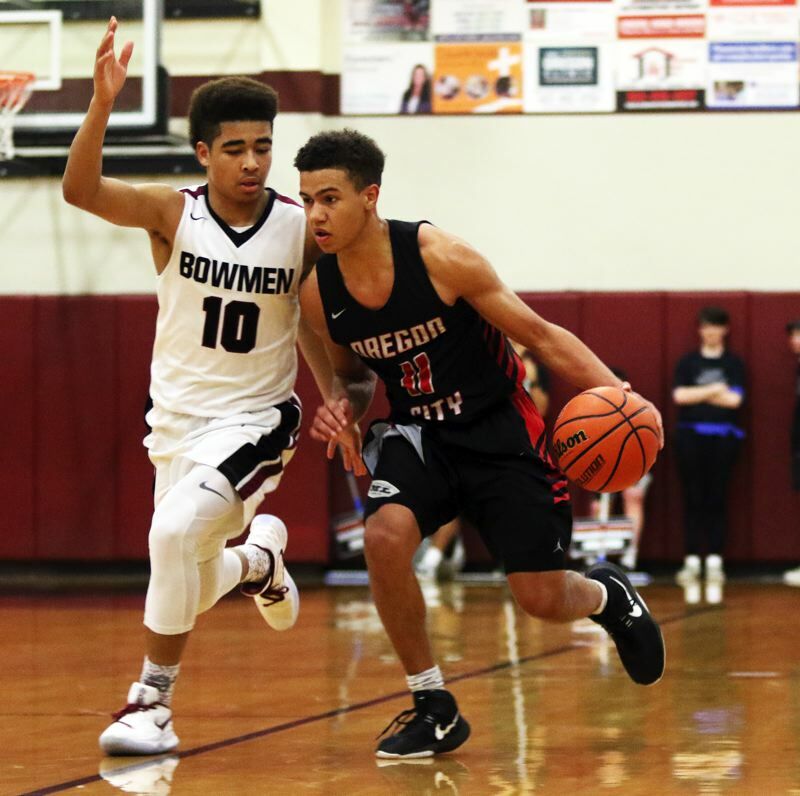 "That was a big team win out there," said Oregon City junior guard Andre Best, who sank five 3-point baskets. "It's nice to end our preseason with a win. It was pretty intense, but we just stuck together. That was a team win." With the win, Oregon City upped its overall record to 9-3. "It was just playing hard," Remsburg said of the victory. "We were all focused, and we really wanted to win. We played hard, executed our things, and got it done." Sherwood moved to 9-4 on the season with the setback. "I think they came out and hit us in the chin a little bit," said Sherwood senior guard Tyler Hix, who connected on three 3-pointers. "We weren't ready for their toughness. We knew they were good, but we didn't come out ready to play. For sure, this will help us out. This is probably the best team we've played so far. They're a good team, so this will help." Best helped the Pioneers get off to a fast start in Friday's contest. 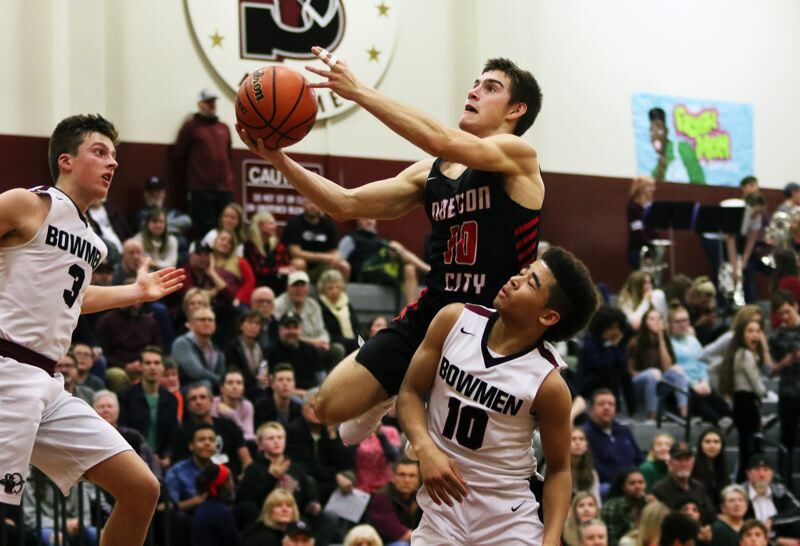 He scored eight points in the opening period, sinking a pair of 3-pointers in the process, as Oregon City grabbed a 15-12 lead going into the second quarter. From there, the Pioneers continued to have a hot hand. Junior Dalton Welch was good on a pair of 3-point shots, helping Oregon City up the margin to 21-15 with 6 minutes and 15 seconds left before halftime. The Pioneers would go on to open a 29-20 advantage following a layup by senior Blaze Bergren coming with 3:29 remaining in the second quarter. But that's when Sherwood started battling back. 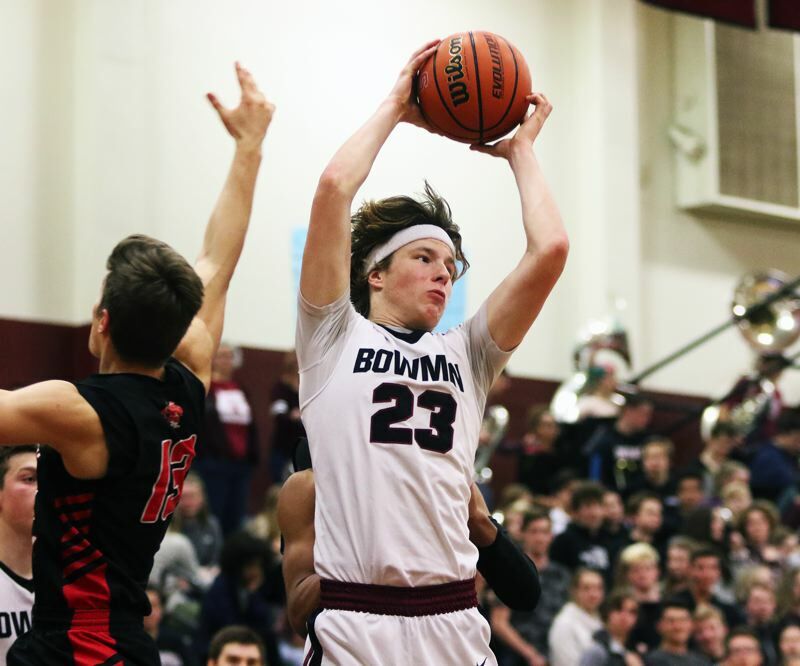 Bowmen senior Braden Thorn scored four quick points. 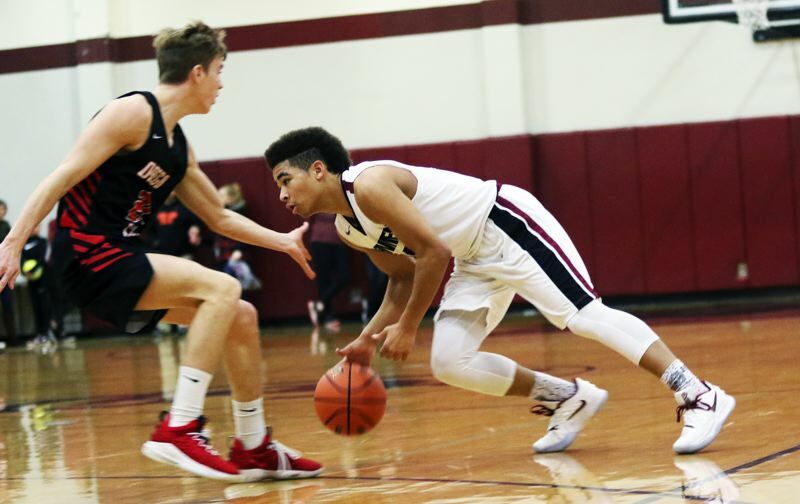 Junior point guard Jamison Guerra made a pair of free throws and Sherwood ended the period with back-to-back 3-pointers by Thorn and sophomore Asher Krauel, trimming the Oregon City lead to 33-32 at halftime. The Bowmen carried their momentum into the third quarter. Thorn opened the period with a 3-pointer, coming off a pass by Guerra, who would go on to make a 3-pointer of his own, giving the home team a 38-36 lead with 5:29 left in the period. 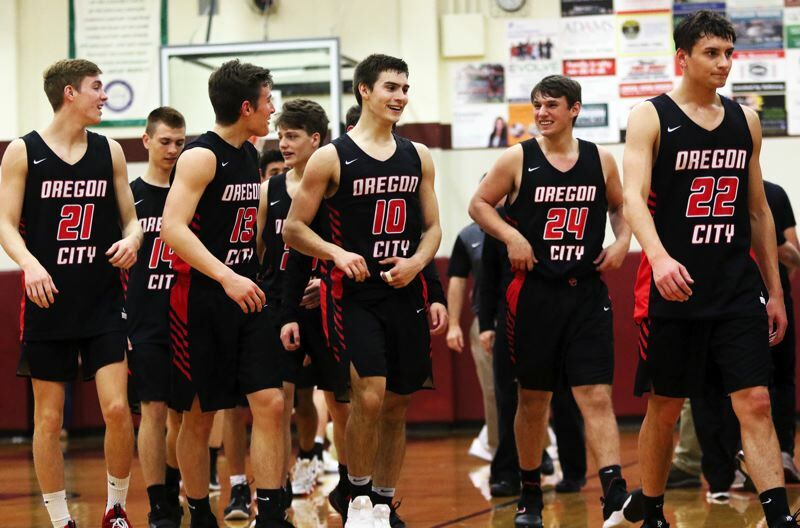 Oregon City answered with an 8-0 run, which included a 3-pointer by Best and five straight points by Remsburg. The Pioneers, who got a last-second 3-pointer by Best to end the period, would take a 47-43 lead to the fourth quarter. That's when things really got intense. 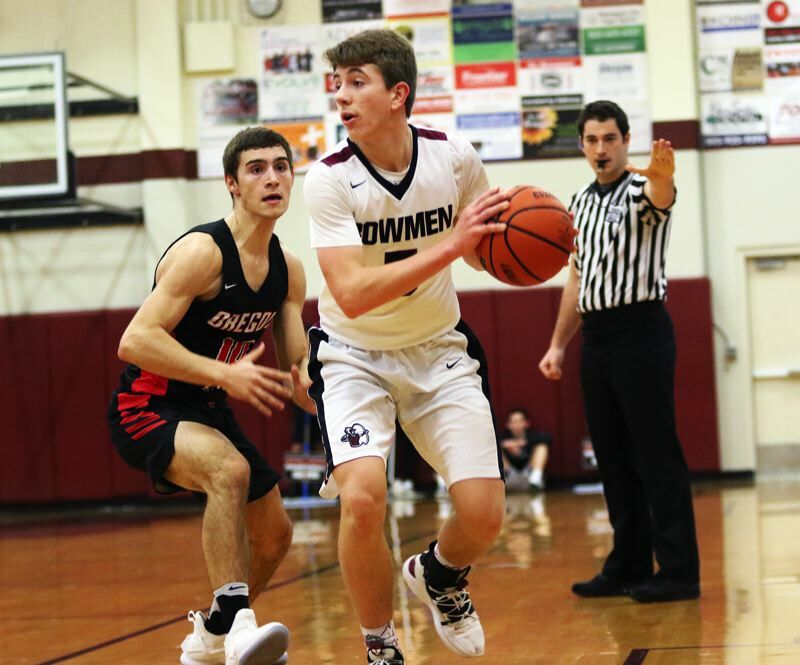 Sherwood seemed to grab momentum early in the final stanza, as Hix hit on back-to-back 3-pointers from the right side, giving the Bowmen a 51-48 advantage with 5:53 left in the contest. "I got a little frustrated in the first half," Hix said. "I wasn't hitting, so I knew I needed set my feet and hit my shots." Oregon City came right back, in a big way. Pioneer senior post Erich Nova was fouled as he made a follow-up shot. He missed his ensuing free throw, but Remsburg cut in to grab the rebound, and he made a follow-up basket of his own, essentially giving Oregon City a 4-point play, and a 52-51 lead with 5:37 left to play. "Coaches told me I needed to get an offensive rebound, so I went and got one," Remsburg said with a smile. "That gave us a lot of momentum." Sherwood regained the lead on a basket by Guerra, but Nova scored the game's next five points, and Oregon City junior Jake Gettel added a free throw, giving the Pioneers a 58-53 lead with 51.3 seconds left to play. From there, Oregon City got two more free throws from Nova and a breakaway dunk by Remsburg to wrap up the 62-54 victory. "These games are always fun," Best said. "In situations like that, in practice, we work on those things, and it was just like a practice." "We were just locked in. We got a lot of offensive rebounds, and that gave up second chances," Remsburg said. "We come through in the clutch. We're that team — we like to push through down at the end." In addition to Remsburg's 18 points, the Pioneers also got 17 points from Best and 12 from Nova, including 10 in the decisive fourth quarter. Welch scored eight points, all coming in the second quarter. 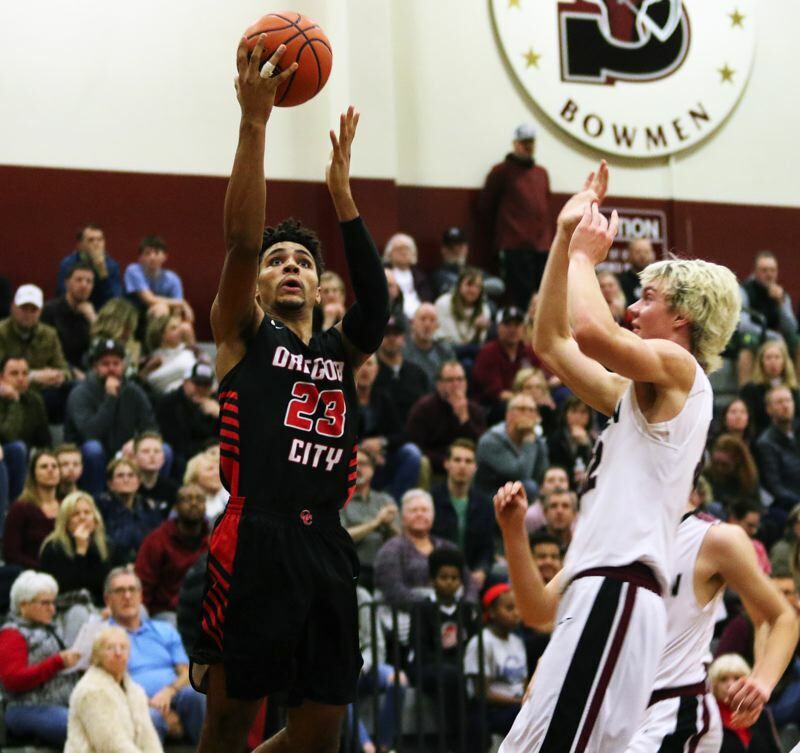 Oregon City, as a team, made 23 of 47 shots from the field, with eight 3-pointers, and eight of 13 free-throw attempts. Thorn led a balanced Sherwood scoring attack with 14 points. He also had seven rebounds. Krauel scored 11 points. Guerra had 10 points to go with four assists. Hix scored nine. 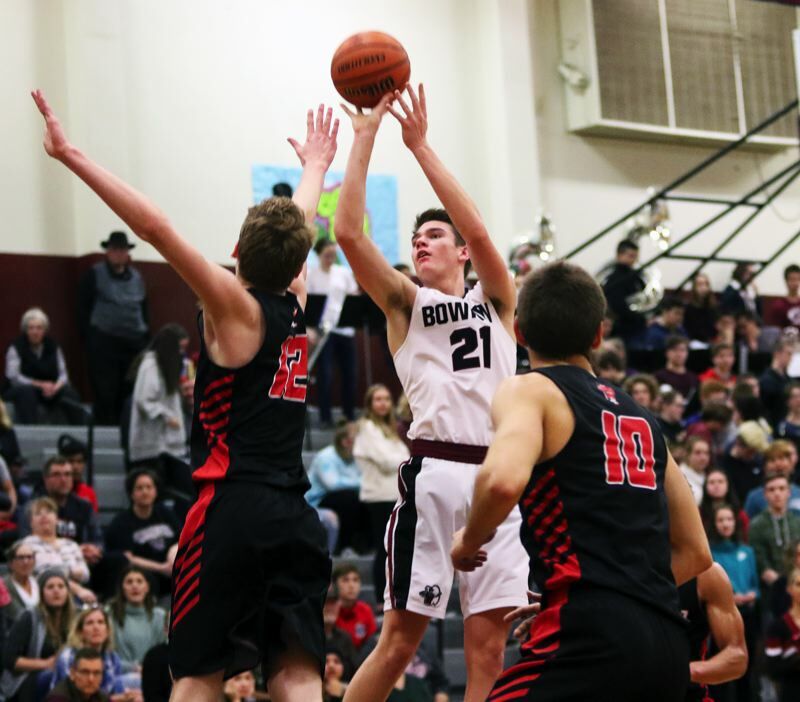 The Bowmen made 18 of 46 shots from the field, with 11 3-pointers, and seven of 11 free-throw attempts. "This was great. It felt like a playoff game. Hopefully, we'll have another one with them later this year," Hix said. "We started to pick it up in the second half. The third quarter was good for us. We hit some big shots and got some stops. We just have to be more consistent." 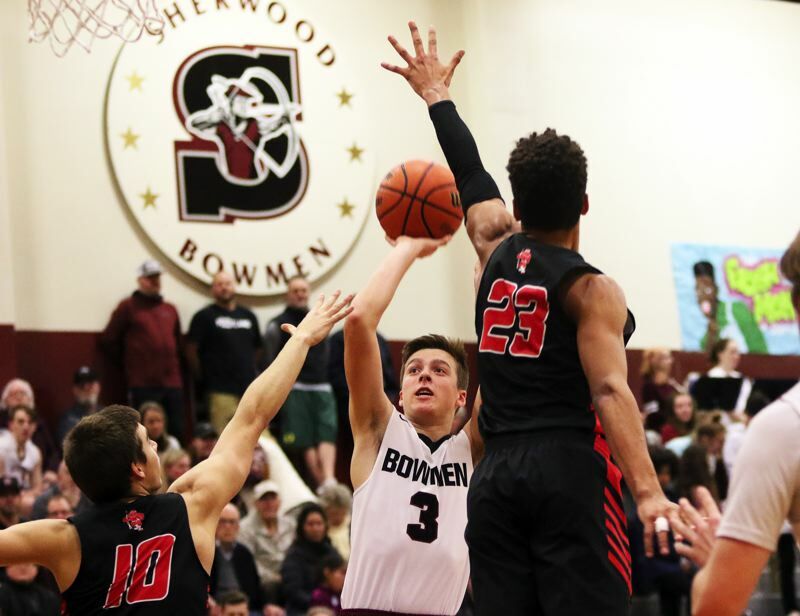 Sherwood will be back in action on Wednesday, when it plays at Liberty in a Pacific Conference opener starting at 7 p.m.
Oregon City will take the court again on Friday, when it opens Three Rivers League play with a 7:15 p.m. home contest against Lake Oswego. "We're looking forward to it," Remsburg said of Three Rivers League play. "We'll be ready. It will be tough, but it will be fun, too."